The FIFA Council on Friday approved working with Qatar to explore expanding the 2022 World Cup to 48 teams by adding at least one more country in the Persian Gulf to host matches. 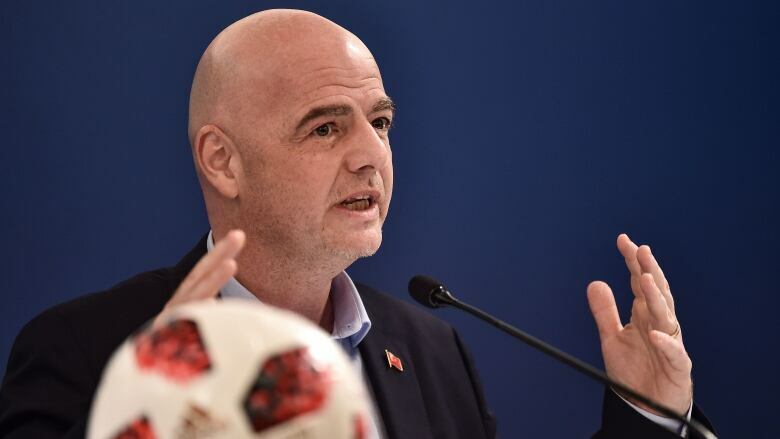 FIFA President Gianni Infantino wants to enlarge the tournament from 32 to 48 teams, which a FIFA feasibility study said would require at least one additional country to be used among five nations identified as possibilities. FIFA will work with Qatar to produce a proposal for consideration in June when the council and congress meet in Paris ahead of the Women's World Cup. FIFA decided in January 2017 that the 2026 World Cup will be 48 teams when it is co-hosted by the United States, Canada and Mexico. The Associated Press on Monday revealed details of a FIFA feasibility study that said Qatar would not be forced to share games with Bahrain, Saudi Arabia or the United Arab Emirates unless those countries restore diplomatic and travel ties with Doha. The FIFA Council agreed to introduce a pilot tournament of an enlarged 24-team Club World Cup in 2021 despite European opposition. "We hope all the greatest teams will participate," Infantino said. "The best teams should have this world platform. ... We will continue our discussions." A quadrennial version would launch in June-July 2021 to replace the current Club World Cup, a seven-team event played each December. Ahead of the meeting, the European Club Association wrote to FIFA saying none of its teams would participate in 2021. The ECA had no immediate comment after the decision. The letter, viewed by the AP, was signed by top executives from 14 leading European clubs, including ECA head Andrea Agnelli of Juventus. The ECA executive board letter said it was "against any potential approval of a revised CWC at this point in time and confirm that no ECA Clubs would take part to such competition." Those concerns centre on not wanting FIFA to add new competitions until there is an agreement on a new international match calendar from 2024. "We have to take care of the footballers," Barcelona President Josep Bartomeu told the AP ahead of council meeting. "We have to take care about the way of training and the vacation they need to recover every season that they do. If the calendar is not modified, of course we cannot agree."